New Pillows? The Monk has obviously lost his marbles. Writing about new pillows. Well, we've been moving bedrooms, giving the 2 kids their own rooms rather than sharing, buying 2 new single beds for them, and while we were at it, we decided to get some new pillows too. Plenty of choice at Tescos, ranging from the own brand cheapies to some serious money pillows. We got some "Lotus" brand, vacuum packed. My daughter struggled to believe these could be pillows. They're too thin, daddy! 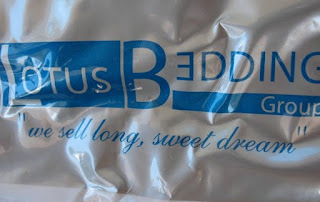 (above) The wrapping for the vacuum packed pillows seemed to show a gay pillow fight... Looking closer, the wrapping claims a 3 minute miracle. 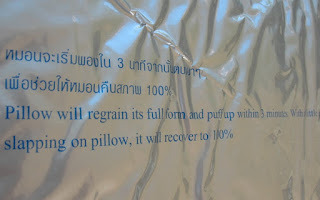 After opening the packet (using scissors, the instructions advised), it states "Pillow will regrain its full form and puff up within 3 minutes", but take note of the added note "With a little slapping on pillow, it will recover to 100%". But what to do with the pillow once it has puffed up? I had not been sleeping too well with my old pillow (not just coz it was a bit stinky). Maybe I needed some extra instruction..? How should the pillow be used (aside from pillow fights)? 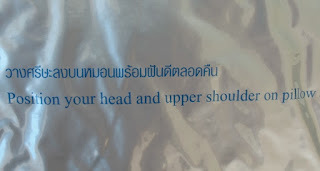 For the hard of reading, let me translate - the instructions above say "Position your head and upper shoulder on pillow". I vowed to try following these instructions that very night! the instructions continue (below) "and be ready for a long, sweet dream". (above) "We sell long sweet dream"
Unfortunately, I don't think I dreamt. Had been out at a friend's house watching Chelsea v Manchester United and had downed a few beers. I slept well, though, that's for sure. 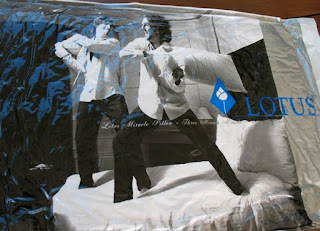 I can recommend a Lotus vacuum packed dream pillow (look for the gay pillow fight in a supermarket near you). Hoping for a long sweet (alcohol free) dream tonight!